I’m getting ready to head to Seattle tomorrow for the Decibel Festival. I’ll be performing graphics live for Dilo on Friday night and Daedalus on Saturday. I’ve spent much of the last two days prepping content and working on (yet another) new performance system/style, and decided to take a break from staring at the screen today to build prototype three of my VJ Box. 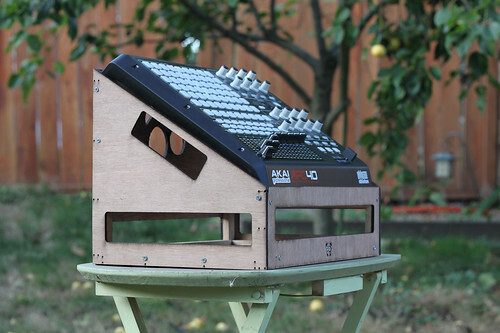 This version centers around the APC40, which can face the artist or the audience with a simple flip of the box. Inside the box will be my external hard drive(s), USB Hub, Power Strips and lots of cables. The idea is to plug in as much as possible beforehand, so you have only a few last connections to make once you’ve arrived at the venue. Inspirational props go to Middleman for his amazing Plexiglass Table, Pleasuretek for making me want a mobile rig, Daedalus for tilting his monome towards the audience for all to see, and VJ Exavior for showing off his Velcro-Filled VJ Coffin all those years ago.